A Fable-based CCG is on its way, if the current Kickstarter by Flaming Fowl Studios is successful. Launched earlier today, the project — titled Fable Fortune — has already received over $24K of the $365+K being sought in pledges. The goal is to create a free-to-play game that combines the franchise’s most popular system with the CCG format. 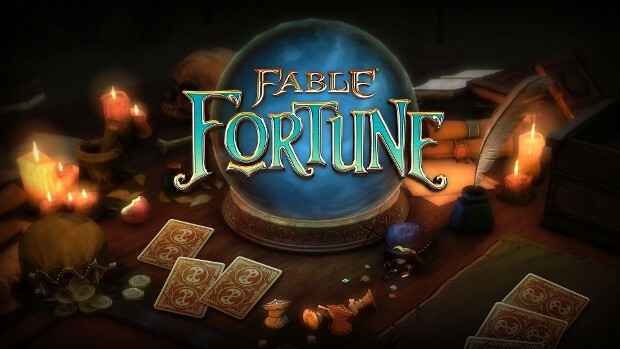 Unlike many kickstarters based on popular IPs, Fable Fortune has been approved by the current brand owner, Microsoft. This means backers won’t have to worry about a copyright infringement-based take down at a later date. It should be noted that the approval is for this game alone and not future games based on the IP. Fable Fortune takes place in the world of Albion, with each match occurring in an iconic location such as Fairfax Castle or the Lynchield Cemetery. As with other popular CCGs, players must complete quests. However, at the end of each, they will be asked to make a choice between good and evil. During battles, players’ choices will morph their heroes, changing the effects of their special abilities and morphing cards into more powerful variants. The game will also feature a unique co-op mode that will allow players to team up with a friend against notable Fable villains. And for those who love in-game events, Flaming Fowl has designed the game with them as a core aspect. More information on Fable Fortune is available on the Kickstarter page, which will be accepting backers until June 28. Everyone who loves Fable or digital card games should go back this! Like now! Do eeet! what the deal with all the card game :S bring real Fable mmorpg alredy know the world wuld live in it! Do you even follow gaming industry news? O.o?